hills wash away to the sea. from earthquakes, streams burst forth or vanish. In Metamorphoses, the Roman poet Ovid, echoing Pythagoras, alludes to geomorphology: the study of the forms taken by the earth’s surface, and what causes them. Almost 19 centuries later, William Morris Davis, S.B. 1869, devised a clear, concise, descriptive, and idealized model of landscape evolution that revolutionized and in many ways created this field of study. Born into a prominent Philadelphia Quaker family, Davis studied geology and geography at Harvard’s Lawrence Scientific School and then joined a Harvard-sponsored geographic-exploration party to the Colorado Territory, led by the inaugural Sturgis-Hooper professor of geology, Josiah Dwight Whitney. Wild stories had circulated since soon after the Louisiana Purchase about Rocky Mountain peaks 18,000 feet or higher. The Harvard expedition set out to investigate, and found none, but they did find “’14ers” (14,000-plus feet). 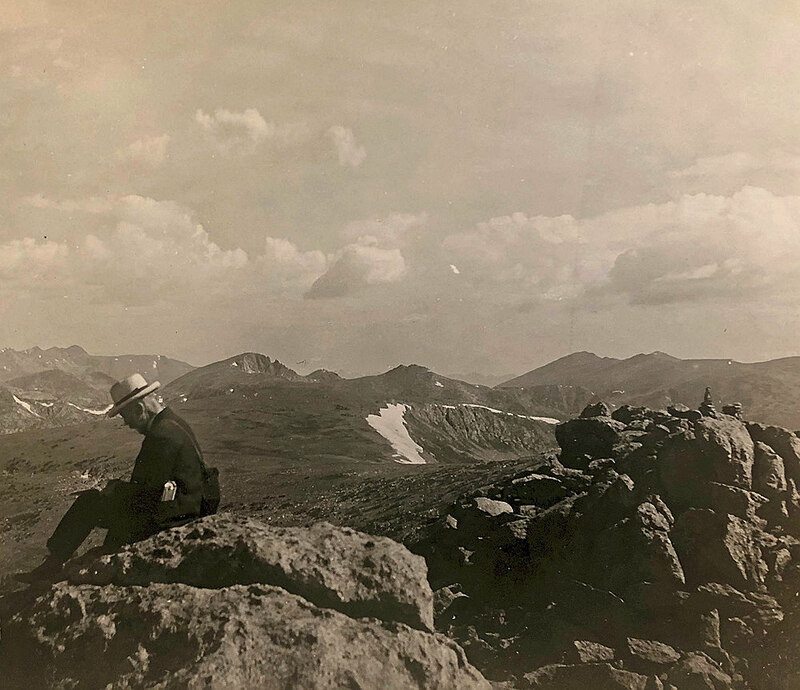 Among these, the expedition members surveyed, named, and made two first-recorded summitings in the “Collegiate Peaks,” designating the tallest in the group Mount Harvard (honoring their sponsor), and the second tallest Mount Yale (honoring Whitney’s alma mater). Once back in Cambridge, Davis earned a master’s in mining engineering from the University’s short-lived Hooper School of Mining and Practical Geology in 1870. Three years at an Argentinian observatory, and a bookkeeping stint in Philadelphia, followed—until geologist Nathaniel Southgate Shaler hired him to teach at Harvard in 1876. He had a slow start in academe, with few accolades for either his early teaching or his early research. (In 1882, President Charles William Eliot even advised him to seek employment elsewhere.) But Davis was tenacious, as well as a keen observer of nature, a master of logical deduction, and a brilliant synthesizer of disparate observations and ideas. From his own field observations and studies made by the original nineteenth-century surveyors of the western United States, he devised the theory for which he is best known: the “Erosional Cycle.” Inspired by the work of Erasmus and Charles Darwin and Jean-Baptiste Lamarck, it had a strong evolutionary flavor. Alongside tectonic uplift, Davis identified rivers and their tributaries as the primary agents for altering the appearance of landscapes, and distinguished three anthropomorphically named stages of landscape evolution, all initiated by uplift. In “Youth,” narrow, incised river valleys locally decrease the growing elevation differences between “uplands” and “base-level” caused by uplift. In “Maturity,” these elevation differences and the number of branching streams reach their maxima, while valleys cut downward and broaden. In “Old Age,” the ever-broadening valleys hold meandering channels that create rolling lowlands (“peneplains”). In a complete cycle, the stages transition gradually unless interrupted and reset by subsequent uplift (“Rejuvenation”). This theory, published between 1886 and 1911, moved geomorphology, despite some opposition, from purely local descriptions to global explanations—and in the history of his discipline, time is often demarcated as “before” or “after” Davis. By the time he became a full professor in 1890, Davis had published more than 100 works on everything from astronomy to zoology and was renowned for inspirational lecturing and the complex but lucid blackboard illustrations he executed ambidextrously. Having lamented once that his field was “as much a sealed book to the person of ordinary intelligence and education as…a great cathedral would be to a backwoodsman….It makes one grieve to think of the opportunity for mental enjoyment that is lost because of the failure of education in this respect,” he worked to rectify the situation; his pedagogical ideas would affect the content and teaching of physical geography in primary and secondary schools worldwide for nearly a century. In 1899, Davis himself became the Sturgis-Hooper professor, like his mentor, Whitney. He received numerous awards from professional societies and honorary doctorates on three continents; he even became a knight of the Legion of Honor. Retirement from Harvard in 1912 did not end his influence. Although deeply shaken by World War I and the deaths of his first, and then his second, wife, he rallied by the mid 1920s: marrying a third time, lecturing widely, and relocating first to the University of Arizona and subsequently to Caltech. He produced key works on the origins of coral reefs and on erosion in deserts, along coasts, and in limestone caverns, and created more print pages and drawings as an octogenarian than most do in an entire career. His cyclical model fell under attack—including by some in his former department at Harvard: faulted for ignoring the erosional roles of climate, underlying geology, physical processes, and the marine environment as well as changes in global sea-level. In his deductive determinism, he often appears to conflate model with observation. Dogmatic? Perhaps he was. Yet Davis was the first to give qualitative coherence to a field awash in decades of disconnected descriptions. His model does not answer all geomorphological questions, but in its elegant simplicity, it still holds pedagogical value. Philip S. “Flip” Koch ’78, a faculty member at the Colorado School of Mines professing in earth science and finance, has ascended Mount Harvard multiple times.